Apparently 2018 is the year that we wish our lawmakers would listen to the wise words of teenagers. This speech by Emma Gonzalez is everything. Of course this morning the president took to Twitter to blame the shooting on the Russia investigation and he gave a giant thumbs up and smiled when visiting Parkland survivors. He is a disgusting idiotic lunatic and every member of the GOP who continues to turn a blind eye to this man will be on the wrong side of history. Okay, now that I've gotten that out of my system, I can report out on my week. I usually love a good rainy day, but this is getting a little old. We've put our weather shield to good use on the stroller. I just checked the week ahead's forecast and while we get a reprieve today and maybe Tuesday, I'm about as excited for more rain as Simon was to head into Costco earlier this week. He loved it! Ha! Friday night I attended the grand opening of New Albany's Kula Center and the new home of Inner Spring Yoga. I am so inspired by Carrie and Rob -- they have done an amazing job -- it is such a beautiful space. I cannot wait to go take class there! It was fun to see a lot of the NA yogis I know and love too. Miss everyone up there! I'm reading a fantastic book that appeals to my inner student of literary criticism -- Wild Things: The Joy of Reading Children's Literature as an Adult by Bruce Handy. 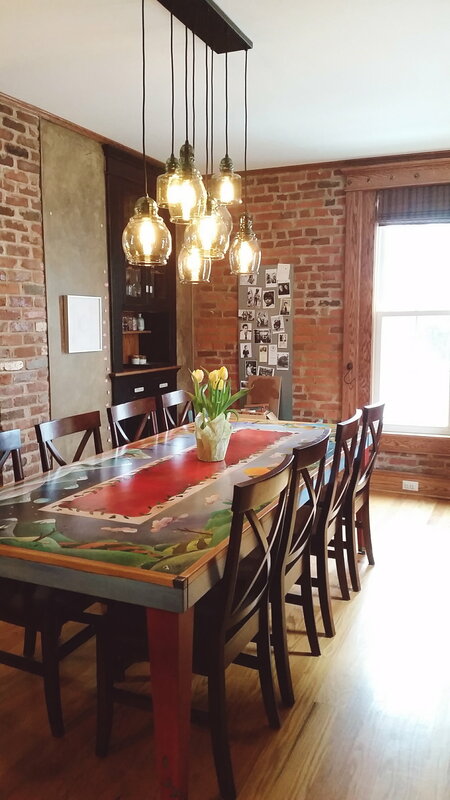 Not much else to report other than we finally got a new light fixture for the dining area. The one we had before barely gave off any light and rendered the whole area useless. Given the number of glass pendants, it was bit of bear to install. I provided moral support to Andrew and Dad by hiding upstairs when things got tense. Okay, now I must get into the kitchen and bang out some meal prep. I finally ordered this cookbook for myself and it is just as wonderful as everyone says it is.